For a meal with a taste of Italian try Fettuccine Alfredo (read here other news). This is a dish to which one can add a variety of meats or seafood such as chicken and shrimp. 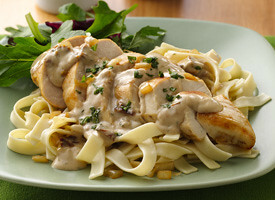 The recipe requires 12 ounces dried fettuccine,3 tablespoons butter, 12 ounces skinless, boneless chicken breast, cut into bite-size pieces, 2 large red or yellowbell peppers, cut into bit-size strips, 3 cloves garlic, minced, 1 1/4 cups heavy whipping cream,1/2 teaspoon salt,1/8 teaspoon black pepper 2/3 cup grated Parmesan cheese, and Fresh basil. To prepare, first cook the fettuccine in a large pot and according to directions on the package, then drain and return to the pot and cover to keep warm. You can add a few teaspoons of vegetable or olive oil t the salted water to prevent pasta from sticking together. Next melt butter over medium flame in a large skillet and add chicken. Cook for 3 to 4 minutes or until cooked through and no pink remains. Remove the chicken from the pot with a slotted spoon. Add bell peppers to pan and cook for 5 minutes, stirring occasionally. Add garlic and cook for 1 minute more. Then add whipping cream, salt, and black pepper and bring to a boil. Boil gently, uncovered, for 2 to 3 minutes or until mixture begins to thicken. Remove from heat; add the 2/3 cup Parmesan cheese and cooked chicken. Add the cooked fettuccine to the pan, stir gently and serve with additional Parmesan cheese and fresh basil.